Summary To co-incide with the Clinton Global Initiative conference, a humanitarian initiative set up by the former US president, Jim wrote a blog entry for the Huffington Post explaining in detail the initiatives and aims of the Better U Foundation. 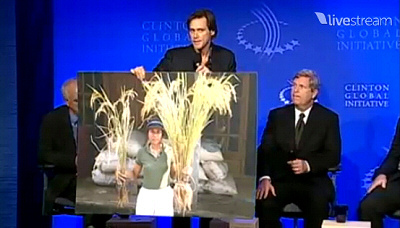 On Tuesday we told you about Jim Carrey's talk at the 'Clinton Global Initiative' conference, a humanitarian initiative set up by the former US president. Joined onstage by various aid organisation spokespeople and experts in their field, Jim was there in a serious capacity as founder of the 'Better U Foundation', adding humanitarian to his growing list of accolades. He began his talk with a summary of his primary aim, to bring about the global awareness of SRI, or 'System of Rice Intensification' farming. Admitting that he isn't a farmer himself he joked "I'm not a farmer, but I grew a few plants in the 70's until my parents caught me." His passion for the cause was clear and holding up a visual aid, the audience and his peers on stage were noticeably impressed. Looking at the production improvements in Madagascar and Haiti Jim drew audible gasps from the audience when he quoted the statistics, 50-150 percent more yield while using 50 percent less water, 90 percent less seed and no fertilizer or pesticides. 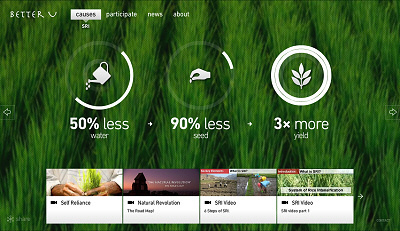 The collateral environmental and thus human benefits of SRI are equally impressive in a world where 1 billion people overeat and 1 billion people don't have enough to eat. -- Source: Clinton Global Initiative. Click to Click to comment this article.